3D printer is a new milestone in consumer electronics bringing on your desk the possibility to print three-dimensional objects both designed by you or downloaded amongst the numerous models available on the Internet. 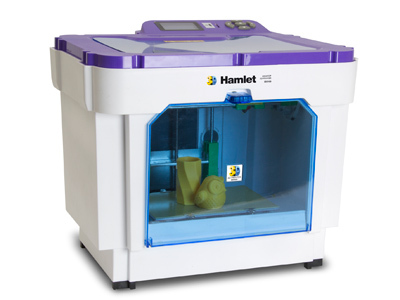 Hamlet 3DX100 allows you to create working prototypes and finished models from a simple ABS or PLA filament. The printer uses 3D printing additive technology, which consists of an innovative manufacturing method of a hot thermoplastic filament deposition. The printer works both connected to a PC or in standalone mode using a Secure Digital memory card reader.